The desire to make the world a better place is innate in all human beings, but it's stll an everyday challenge. Science writer Matt Ridley explains this in his book, The Origin of the Virtue. He states: “Living things are designed to do things that enhance the chances of their genes or copies of their genes surviving and replicating.” And this aspiration has pushed many entrepreneurs in our country to build their own social enterprises or businesses for a cause. According to the report that the British Council of the Philippines released last 2017, there are already 164,473 social enterprises operating in our country. Growth is expected with the sector’s relentless pursuit of generating employment, alleviating poverty, improving a local community, and empowering a marginalized group. Capital and public awareness, on the other hand, are considered barriers to the industry’s growth. In this article, seven social entrepreneurs prove how barriers can never defeat a man determined to uplift the world. Learn from their experiences and see why their successes can be considered the most fulfilling. Cut the Scrap upcycles scrap wood and repurposes junk materials to help cut the world’s trash. 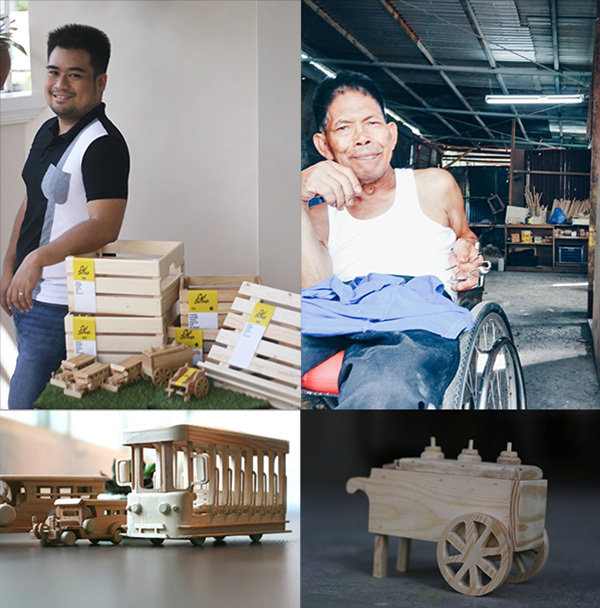 My wife Kai and I built it last 2014 in support of PWD Kabuhayan Industries Association of the Philippines. My experience starting the business involved a lot of hard-work driven by my ambition to help my father-in-law. My late father-in-law, Mr. Jess H. Docot, founded PWD Kabuhayan. He was a PWD himself. His group dabbled in different trades including woodworking. His passion in woodwork and advocacy to help people inspired me. 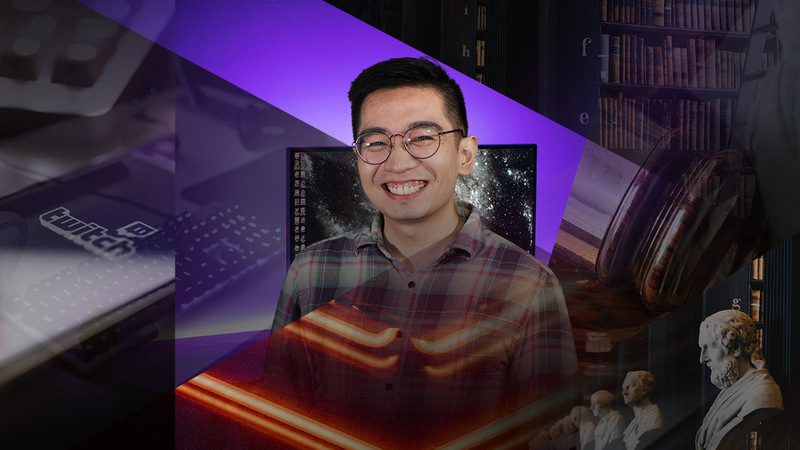 So together with Kai, we helped design and market their products. Since it was a small woodshop, we sourced our materials from scrap yards and used discarded wood from other large furniture companies. Running Cut the Scrap can be overwhelming, but in a good way. Our small woodshop is sometimes fully booked with huge bulk orders. So to continue being true to our advocacy, we tap fellow PWD stores like Tahanang Walang Hagdanan. Managing Cut the Scrap also entails us to practice proper time management between this business and our day jobs. What’s important is that we are able to provide livelihood to our fellow countrymen, particularly the PWDs. From there, we have reached as far as having our wooden Sorbetes Cart included in the GoLokal souvenir line of Department of Trade and Industry. We are also blessed to be part of the growing family of Common Room PH. 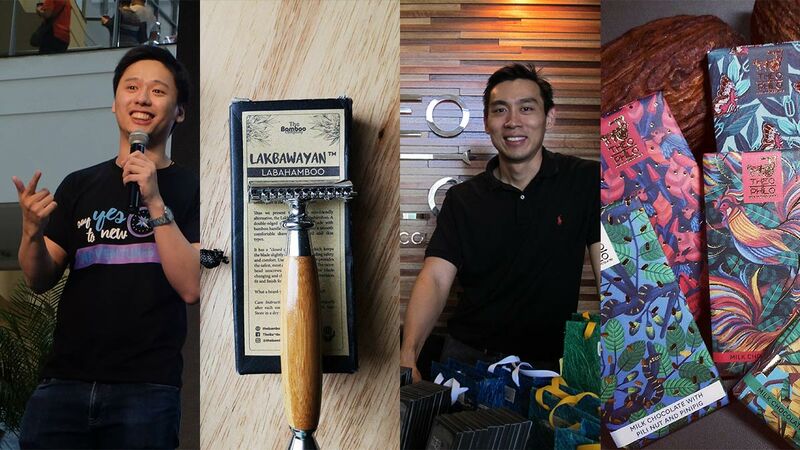 It opened a lot of opportunities for us and allowed us to showcase our products in prime locations like Katipunan, Powerplant Rockwell, and Alabang Town Center. Here’s my advice before you start your own business for a cause: Inspiration can be found anywhere. And if you are planning to start a business with an advocacy, equip yourself not just with inspiration and drive for innovation, but an advocacy that’s deeply rooted in your heart. Don’t be afraid to take the leap. And when you do so, always believe in your product and your people. Then everything will fall into place. 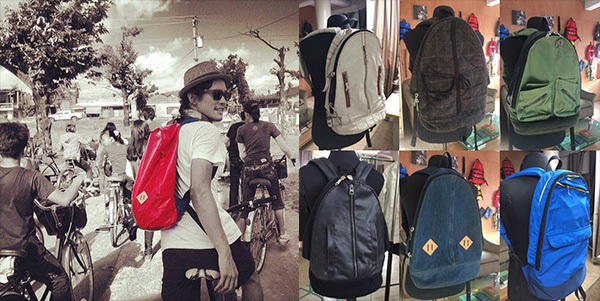 Taclob Upcycled Bags uses upcycled jeans and jackets to produce backpacks. Its mission is to make upcycling popular while creating an impact on our marginalized communities. I formed it together with Justin Carpen and Kenneth Uy last January 2014, after Typhoon Yolanda shattered Tacloban city. I saw the survivors’ need for jobs that would help them long-term. My experience starting the business was very hard because we were working in a post-disaster zone. Everything was broken—the city, the infrastructure—and the community was in trauma. The first thing that I did was I crowdfunded to set up the facility to train the survivors. After the funds were consumed, I raised investments through family and friends. A year after the tragedy, Taclob was able to give a hundred percent of our commitments and orders to all our clients and supporters. Running Taclob really tested my abilities, especially in helping people. The main challenge was that I had zero knowledge in operating a business, a social enterprise, and even a post-disaster zone. What came next is working with the sparse funding, broken city, and depressed survivors. It was all worthwhile because ever since day one, Taclob has been providing meaningful help to our brothers and sisters. From there, we have reached as far as transforming the lives of 20 survivor families who desperately needed income when they had nothing. We were able to give them high-value, lifelong skills in making bags and upcycling. And right now, we’ve been holding trainings not just for the survivors of Yolanda, but also for deaf and mute communities. We’ll soon be spreading the movement to our Aeta groups, too. Here’s my advice before you start your own business for a cause: You have to be whole first before trying to mend the brokenness of others. It’ll be hard for you to help others if you can’t even help yourself. Building a social enterprise is not just about passion, but also compassion. And that compassion must be overflowing. Be sure of what you want to do and when you are, then do it and stick to it no matter what. 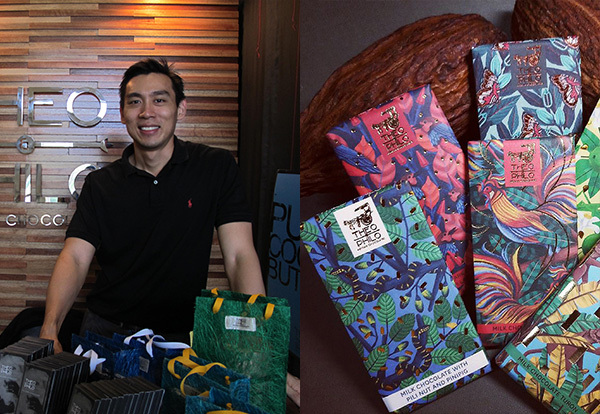 Theo & Philo Artisan Chocolates is the first bean-to-bar chocolate in the Philippines. We exclusively use Philippine cacao beans to produce our products. Our mission is to do good while creating good. Not only do we aim to make Philippine chocolate a global namesake, we also strive in uplifting the lives of our cacao farmers and employees. My experience starting the business was exciting at first. Since it’s chocolate that we’re talking about, most people I’ve encountered were as thrilled as I was. There have been challenges, too. Every time I explain to my suppliers that cacao grows in the Philippines, I end up getting blank stares. I also initially built Theo & Philo as a for-profit business. Back then, I thought that a business must succeed first before setting off an advocacy. Then a year after, I met people from Gawad Kalinga who told me that it can be done by integrating the system into the company’s supply chain and processes, creating a sustainable loop that benefits all parties involved. Running Theo & Philo can be tough because of the need to balance what we can do to help our beneficiaries versus what makes sense from a business standpoint. Yet at the end of the day, life is not just about making money. I’m glad to say that I’ve built a second family through our business. From there, we have reached as far as having our chocolates exported to Japan. We also started joining competitions and earned seven awards from the London Academy of Chocolate and three awards from the International Chocolate Awards. Here’s my advice before you start your own business for a cause: Always aim for the best in every aspect of your trade. Having an advocacy is not enough to set you apart from competition. The key is to carry it out while still serving the needs and desires of your customers. And because running a business is difficult, surround yourself with people who will always back you up. 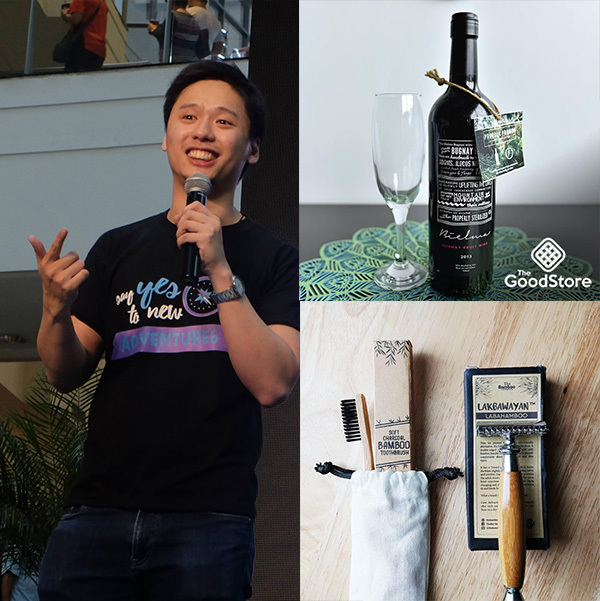 The Good Store believes in each person’s ability to live a socially responsible lifestyle. And the website is the e-commerce platform where we encourage everyone to start living by this belief. We partner with other social enterprises whose products and brands create a social, cultural or environmental impact on different communities and non-government organizations. We house all these products on our site where consumers can easily find and purchase them. My experience starting the business was challenging. It's not easy to start a new business, especially one with an advocacy. Our first step was to decide our priorities. We weighed both the economic and intangible aspects of taking this path. Besides this, we went the extra mile in finding partners who have the same heart and passion as we do. It took us two years to form the Good Team, as the share here is not just time and money, but also an enduring willingness to serve others. Running The Good Store requires effort in preserving the integrity of our brand because, first and foremost, we are promoting goodness. Everything we endorse should be first-rate. We want our customers to buy our products out of their own liking and not just out of pity. And since Filipino consumers are still getting their heads around e-commerce, we invest heavily on promoting our stuff through social media. From there, we have reached as far as having been able to enrich the lives of our partner suppliers and their beneficiaries. Because of our site, these stay-at-home moms, out-of-school youth, marginalized farmers, and rural communities have developed their own heartwarming transformation stories. Here’s my advice before you start your own business for a cause: Be clear on your purpose. Try to imagine what you would do if the business has been helping communities, but unable to earn profit. Will you continue to do it? Find business partners who are as driven as you are. Keep in mind, too, that if what you are doing is for the good, then everything will be worth it. 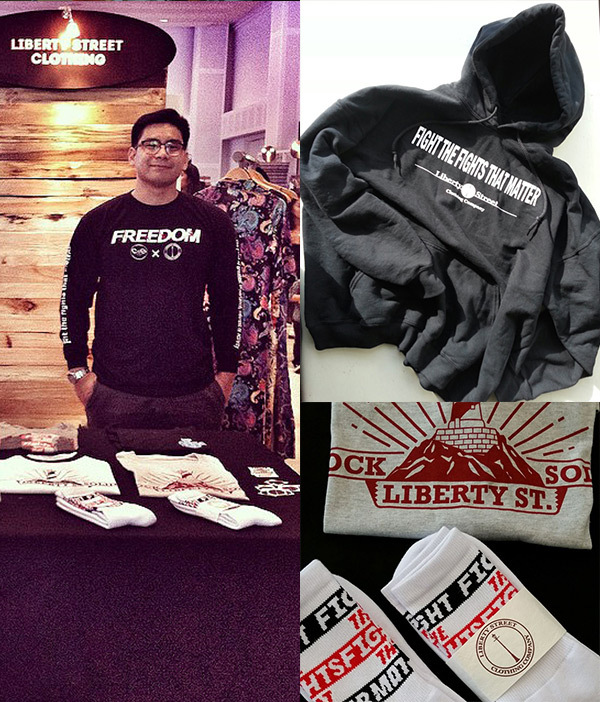 Liberty Street Clothing Company was formed by my friends and I to provide employment for survivors of social injustices in our country, most especially those of human trafficking and sexual exploitation. Every apparel purchased from our store not only benefits our partner NGO, International Justice Mission, but also helps us spread the fight against these rampant issues. My experience starting the business was exciting. I knew that there was a lot to discover about running a business, more so one that promotes social awareness. True enough, it gave us an opportunity to meet a lot of people with whom we share our mission with. On the other hand, it also tested us. All of us are professionals with day jobs to attend to. Balancing this and our desire to help others is no easy task. It is passion that has kept us surging through the fight. Running Liberty Street Clothing gives me a sense of accomplishment, knowing that our customers’ purchases impact the lives of our beneficiaries and their families. And although we have to juggle this business with our 9-to-5 work, we still make sure to involve ourselves in anti-human trafficking campaigns. From there, we have reached as far as promoting positivity to a great extent. We take pride, too, in having millennials and the youth heed our call to the community. Our shirts are designed for these age groups, as the young are always fired up to change the world. Here’s my advice before you start your own business for a cause: It takes time to achieve anything worthwhile, so be patient and be sure to make wise decisions. Do not underestimate yourself and what you can do. Build healthy relationships with your partners in trade. And as Liberty Street believes, fight the fights that matter. Trail Adventours is an outdoor outfitter, organizing hikes here and abroad. 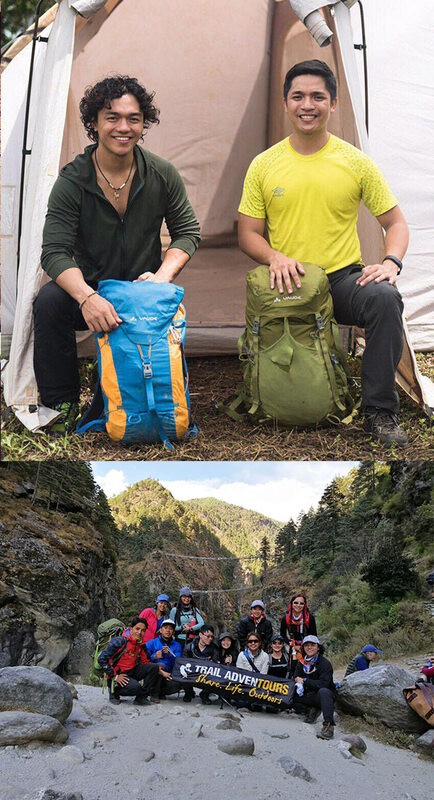 My brother Coby and I started it with a clear mission to share life outdoors with hikers and underprivileged communities. We find ways to respond to these communities by holding various trainings to enhance their guiding skills, building book and toy libraries, and bringing up supplies to their areas up the mountains. We also promote the Leave No Trace principle, which involves disposing of waste properly, minimizing campfire impacts, and respecting wildlife. My experience starting the business was driven by our passion. Coby and I have been hiking since we we were eight and nine years old. The idea and opportunity came when Coby wanted to do a series of hikes in South East Asia, but didn’t have enough funds. A friend then asked him to help organize a hike, which helped significantly in raising enough funds to take that SEA expedition. This was a eureka moment that made us realize we can actually earn by doing what we love. And it worked to our advantage that we entered the market at the right time. When we started the company in 2010, hiking was still niche. When the hiking industry boomed in 2013, we were already the go-to agency for most beginners. Running Trail Adventours required us to approach things differently and deal with the unglamorous side of running a business—managing employees, reviewing financial statements, setting up systems, etc. Yet despite all these, it has always been about the people we serve. Many times we were on the brink of shutting down the business. But whenever our fuel runs low, we go back to our “why." Whenever we hear stories of gratitude from our participants, beneficiaries, and employees, it makes everything worth it. From there, we have reached as far as being the leading outdoor outfitter in the country. We’ve just turned eight years old and to date, we’ve successfully shared life outdoors with at least 10,000 unique individuals. We have over 40 well-trained and experienced adventure guides; we have the most extensive destinations offered from beginner trails to challenging expeditions here and abroad (60 local and 12 international destinations, including Mt. Everest Base Camp). Here’s my advice before you start your own business for a cause: First is to simply start. There will always be excuses, reasons, and what ifs. All these are basically bron from fear. We overcome fear by simply doing. Once you’ve started, use creativity and innovation as your trails that will bring you up the top.